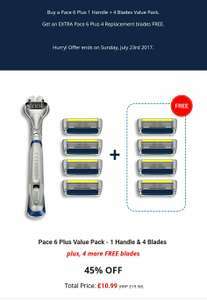 Pace 6 plus handle and 8 blades. Already 45% off, but using code WELCOME5 brings it down to £5.99. I personally prefer these to another well known brand, but as other debates have shown, it's each to their own blade! Worth a go at this price, thanks! I didn't think they were good at all! Threw my starter pack away after 2 attempts! Orders over £10 are free too so I wonder if price before discount is applied? Think I may give this a go. I've bitten the bullet, they'd bloody well better not think I'm subscribing! Orders over £10 are free too so I wonder if price before discount is … Orders over £10 are free too so I wonder if price before discount is applied? Think I may give this a go. Actually T&Cs show they share your info with 3rd parties so I'm out. Glad I didn't go for it now, esp with a few people saying the razors are not that great. Sorry but I'd anyone say they're on par with Gillette are delusional. I also noticed the blades don't last anywhere near as long as Gillette blades. It's false economy. Nope isn't. I regretted it. I wasn't impressed either. I bought both the Pace 4 and 6 Plus. My 3 blade Gillette disposables give a better, closer shave. The Dorcos ones drag, so are mildly painful to use, and I have to go over the same area a number of times. It's a strange one. I've bought twice before and can confirm it's not a subscription. They should make it more clear though! Is there nothing we can buy with out subscription these days. Printer ink, beer packs, software, console accounts, razor blades. It's a strange world where we can't trust ourselves to buy a new 'thing' before the old one runs out. How ever did my Mother cope? I bought a load of Dorco disposables in a previous promotion. I thought they were OK but they seem to have a wider strip at the top (the lubricated bit) so it's harder to shave close to my nose/lips etc. Other than that they were OK for 50p each. I got a free handle (and a blade) with my disposables to try the heads, I haven't used it but the construction feels cheap. Sorry but I'd anyone say they're on par with Gillette are delusional. I …Sorry but I'd anyone say they're on par with Gillette are delusional. I also noticed the blades don't last anywhere near as long as Gillette blades. It's false economy. I have found the opposite Gillete's don't last long with me these do. After a week of use of the Gillete I feel like I am hacking my face.